For those wishing to pick up a road map on the run, there is a distribution box located in our front parking lot at 970 Dublin Road that is accessible from your vehicle 24 hours a day. A complementary print-version of the Franklin County Atlas can be given from our headquarters lobby at 970 Dublin Road, and the Tax Map Office at 373 South High Street, on the 19th floor, free of charge. They are a useful guide for traveling around the county. 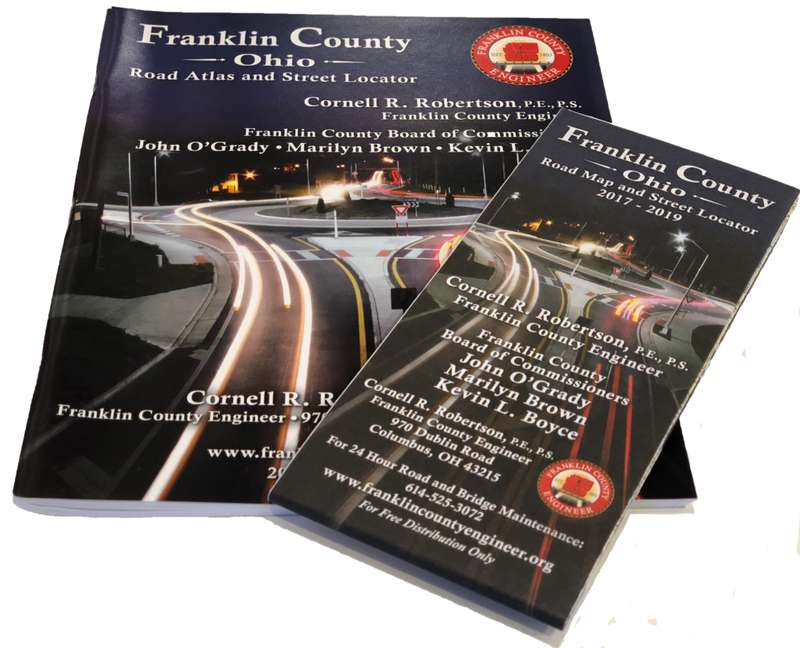 The Franklin County Road Map can be obtained, free of charge, through the Engineer’s Offices and at various county, municipal, township, and state facilities. 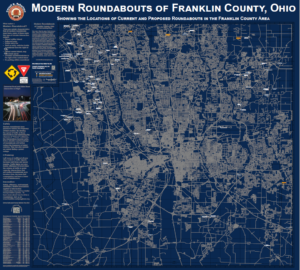 Our Surveying Department has gathered information from numerous public entities such as the Franklin County Auditor’s Office, Metro Parks, Ohio Department of Transportation, and City of Columbus to create the most accurate and comprehensive road map. About 1,250 changes were made to our land and highway record data base since the publication of the 2009 edition. The five-color 44-inch wide and 37-inch tall road map shows over 12,000 public roads, which are listed in the street locator index, and the locations of 1,000 points of interest such as airports, fire departments, government buildings, high schools, hospitals, police departments, post offices, shopping centers, and universities. Also shown are regional street address numbers that are useful in locating specific addresses. For more information about the road map, or to suggest revisions, please contact Ben McCown, GIS Manager. To obtain a State of Ohio Map, please go to the Ohio Department of Transportation Maps Resource Page. Historical maps of Franklin County dating back to 1842, as well as township maps, road record books, subdivision plats, private surveys, county road construction plans, and county road right-of-way plans are housed in the Records Management Office of the Surveying Department. Copies of these records and others are available to the public free of charge or for a nominal fee. Most can be obtained in both hardcopy or digital formats. For more information, please contact Teel Slike, Records Manager at (614) 525-3045.